To make sure cool-season annuals become well established before cold weather sets in, get them in the ground before the end of the month. If planted too late, they just sit and pout until spring. From sixpacks, try calendula, Iceland poppies, pansies, primroses, snapdragons, stock, or violas. In zones 15-17, you can also plant calceolaria, cineraria, nemesia, and schizanthus. You can sow the following directly in the ground: baby blue eyes, forget-me-nots, sweet alyssum, sweet peas, and spring wildflowers. ‘Muskogee’ is one of the prettiest crape myrtles you can grow. The 25-foot-tall tree bears lavender flowers in summer, and in fall, leaves turn brilliant red. This variety is strongly resistant to mildew. Look for ‘Muskogee’ in nurseries. To see the tree in fall color, visit the Gardens at Heather Farm (1540 Marchbanks Dr., Walnut Creek). If you garden on a slope, make sure it’s thoroughly planted so roots will help hold the soil in the event of heavy rains this winter. To temporarily secure a bare slope or one that’s newly planted, sow seeds of wildflowers and a perennial grass, such as blue wild rye (Elymus glaucus), available from Peaceful Valley Farm Supply. In inland and coastal areas (zones 14-17), continue to sow seeds of beets, carrots, chard, onions, parsley, peas, radishes, and turnips. Set out broccoli, cabbage, and cauliflower seedlings. Coastal gardeners can also continue to plant lettuces. In the foothills, the Central Valley, and inland areas (zones 7-9 and 14), sow peas and spinach and plant garlic and onions. To build an easy compost bin that will keep animals out, bend an approximately 13-foot-long, 4-foot-wide piece of 12- to 14-gauge wire fencing into a cylinder about 4 feet across; hook the cut edges together. To fill, chop up materials and alternate a 2- to 8-inch-thick layer of brown material (dried leaves) with a 2- to 8-inch thick layer of green material (grass clippings), sprinkling each brown layer with water as you go. 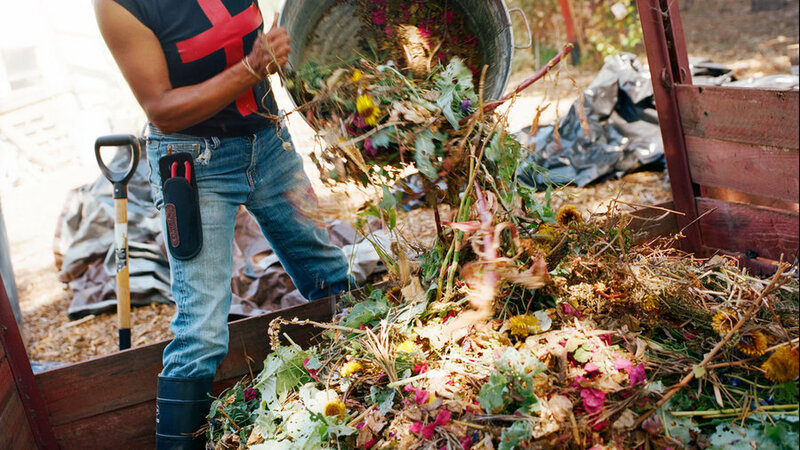 You can top the brown layers with a shovelful of manure or soil to help heat up the pile and speed composting. Keep the pile evenly moist but not soggy (cover it with plastic or locate the bin under a tree to protect it from heavy rains). Aerate by turning the material every few weeks or so with a pitchfork. Clean up debris and fallen leaves around fruit trees, and remove any dried fruit from branches. To control brown rot on apricots, spray with a Bordeaux mixture (hydrated lime and copper sulfate) or other fungicide containing copper. For peach leaf curl on peach and nectarine trees, spray with lime sulfur after leaves fall. Apply sprays on dry days when rain isn’t predicted for at least 36 hours. Thoroughly cover the branches, stems, and trunk as well as the ground beneath the tree.